In traditional Chinese medicine (TCM), coughing indicates abnormal qi activity inside the lungs. TCM believes that the lungs are not only responsible for respiration, but also dominate the qi (vital energy) of the whole body. It inhales pure qi from nature and exhales the impure qi. It also receives nutrient qi from the spleen, combines the nutrient qi with the inhaled qi to form pectoral qi which then enters blood and then is distributed over the body. The different types of qi flow in a specific and coordinated manner, when the qi flows inside the lungs are interrupted, symptoms like coughing, shortness of breath, weakness and even excess sweating will result. The development of a cough can have external or internal origins. The lungs are situated in the chest; they connect with the throat and open into the nose. Among the five yin organs, the lungs are most vulnerable to external pathogens. 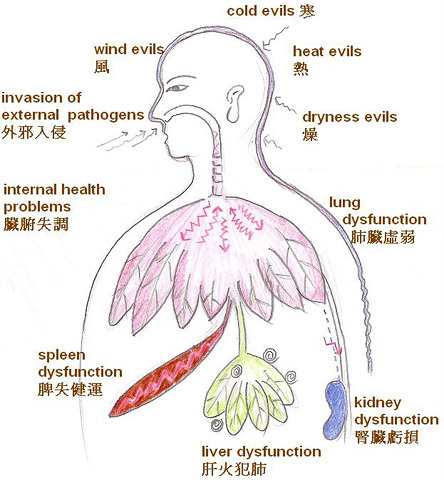 Six pathogens (or evils as they are often known in TCM) tend to take advantage of extreme weather changes or temporary bodily weakness, enter the lungs through the openings of the body. They disturb the qi flows of the lungs, cause abnormal secretions in the respiratory tract and thus induce coughing. In most cases, wind evils are the foremost pathogens to invade the lungs, and they usually join up with cold, heat or dryness evils to accomplish the attack. As a result, the cough may present as different types, depending on the seasonal influence. Coughing can be caused by dysfunction of the internal organs, such as the lungs themselves or other organs involving the lung. Lung dysfunction that can't maintain the normal qi activities inside the system will have coughing as a major sign of the condition. This usually occurs in chronic lung conditions. Spleen dysfunction: When the spleen is dysfunctional, it cannot transform food and drinks into nutrient essence effectively, there will be inadequate nutrient essence to supply the body and respiratory activity will weaken. A dysfunctional spleen also produces dampness and phlegm that attack the lungs directly, and so cause coughing. This is usually associated with an improper diet and excess alcohol intake. Liver dysfunction: Emotional upset or stress can lead to liver qi stagnation; as time passes the stagnated liver will generate fire. The fire may attack the lungs, transform the lung's fluid into phlegm, interrupt its qi flow and induce coughing. Kidney dysfunction: Normal respiration depends on mutual regulation by the kidneys and the lungs. When the kidneys fail to coordinate the lung's qi exchanging activity, it can lead to respiratory problems. TCM views on the development of coughing. Generally, coughs of external origin are usually of acute onset, with known causes and last for a short period; while those caused by internal health problems have a long duration and tend to have flare ups from time to time. No matter what types of cough, effective treatment can only be made by precise diagnosis of the underlying disharmony. During a TCM consultation concerning coughing, the pattern of coughing provides clues to the underlying disharmony. Under normal circumstance, nasal and throat secretions are body fluids that are responsible for moistening, nourishing and protecting the regions. When the secretions become abnormal in amount, color or smell, a pathological activity may be present in the regions or corresponding internal organs. Since TCM sees a cough as being potentially related to different organs, TCM physicians look at the particular symptoms accompanying a cough in order to understand and diagnose it accurately. For example, an itchy throat may indicate wind evils attacking the lungs; frequent urination is associated with unconsolidated kidney qi; fatigue suggests there is qi deficiency and a dysfunctional spleen; and virtual fire also leads to hot flushes, night sweats and red cheeks. A TCM physician does not try to stop or suppress a cough, but rather tries to find its underlying disharmony and how to release it from the body. While it causes discomfort, a cough has a positive aspect since it is the body's attempt to release something that shouldn't be there, such as toxins or energy stagnation.